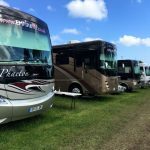 Hire a Motorhome for Reading Festival! You’re lucky enough to have tickets for Reading Festival but now comes the accommodation planning! Festival accommodation near Richfield Avenue can be hard to find. Of course there’s camping but let’s face it, that can be pretty unpleasant. Or you could opt for a nice hotel (if you can find one), but then you’ve got the hassle of travelling to-and-fro in the small hours of the night when you finally decide to call it a night! So if you crave a bit more comfort or just don’t fancy camping this year, why not hire a motorhome. Especially if you’re enjoying Reading Festival with a group of friends and family, as you can easily divide up the cost so it’s seriously cost effective and far cheaper than booking multiple hotel rooms! What’s more, we will deliver the Winnebago or RV you choose to site and set it up prior to arrival. We have all kinds of vehicles available – from smaller vehicles suited to smaller groups to fully functioning, luxury American RVs. All of our motorhomes come fully powered, have a fridge, running water, hot showers – even television and DVDs (you never know when the weather might turn nasty – it is the UK after all)! We make hiring accomodation for Reading Festival utterly painless. All of our vehicles are delivered to the venue and set up prior to your arrival. We leave you with a nice welcome kit, including complimentary tea, coffee, sugar, milk, bread and water. If you want something specific including things like beer, cider and wine, just let us know in advance and we’ll make sure your cupboards and fridge are fully stocked when you arrive. Each of our units comes equipped with bedding, towels, kitchen essentials, TV/DVD systems, outside table and chairs, outside canopies… even outside kitchens and TVs. All you need to bring are yourselves, clothes and don’t forget your all-important festival tickets!! Our crew will be on hand to assist you at any time of the day or night, so you can simply relax and enjoy the show(s)!